THE BOOK FOR EVERY TEACHER WHO HAS EVER BEEN FRUSTRATED BY THE DECISIONS MADE OUTSIDE THEIR SCHOOL THAT AFFECT THE STUDENTS INSIDE THEIR SCHOOL. 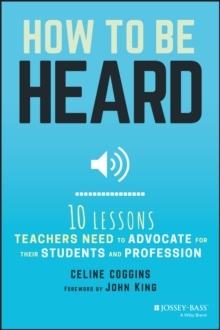 How to Be Heard offers every teacher 10 ways to successfully amplify his or her voice, and demonstrates that when teachers' voices are heard, they will be rightfully recognized and supported as change leaders in their schools. Celine Coggins, a renowned teacher advocate, offers nuts-and-bolts strategies that are recognized as the "price of admission" to becoming a credible and welcomed participant in important policy conversations and decisions. The author clearly demonstrates that it is not only possible for teachers to initiate change, but to also effectively participate on the policy playing field. In ten clear chapters, the author demonstrates how teachers can and must advocate for their students and their profession. Throughout this book Coggins proves that "If you're not at the table, you're on the menu." This how-to guide is filled with concrete ideas for engaging in productive decision-making, using real-world examples from teachers who have successfully used these strategies.